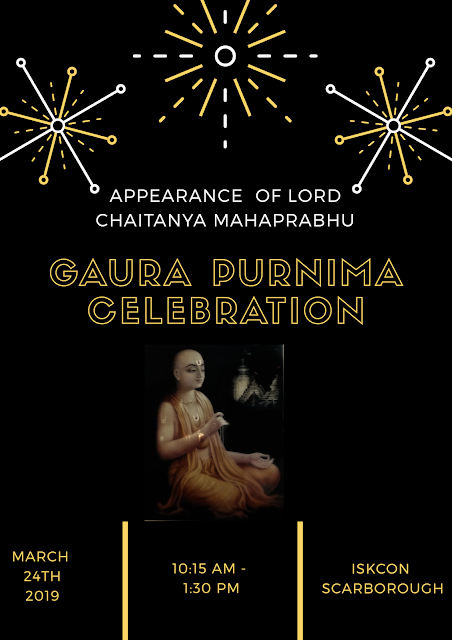 Gaura Purnima - the auspicious appearance day of Sri Caitanya Mahaprabhu will be celebrated in a grand manner on Sunday- Mar 24th 2019 at ISKCON Scarborough. 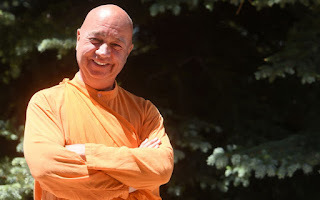 The actual appearance day falls on Wednesday - March 20th 2019 - On this auspicious day, all devotees fast until moon rise. 2) The Lord blesses everyone with the soothing, moon-like rays of His sublime teachings. Lord Caitanya is Lord Krsna Himself appearing in the role of His own devotee. He accepted the mood and golden complexion of Srimati Radharani, His consort and greatest worshiper. Radha and Krsna became one to reveal the divine love of Goloka Vrindavan to the world. Lord Caitanya Mahaprabhu's most important biographers, such as Shri Vrindavan das Thakur (Caitanya Bhagavat), Shri Murari Gupta (Caitanya Charita Mahakavya), Shri Locana das Thakura (Caitanya Mangal) & Srila Krishnadas Kaviraj (Caitanya Caritamrta) confirm this. 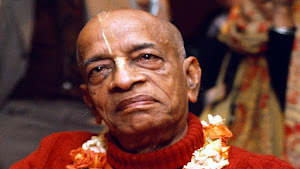 If we are to understand Shri Krishna, we must do so through Lord Caitanya. First the giver, then the gift. Lord Caitanya Mahaprabhu was the most merciful and munificent incarnation of the Lord, whose mercy surpassed the bounds of mundane discrimination in the matter of caste, colour and creed. “Things that are very difficult to do become easy to execute if one somehow or other simply remembers Lord Caitanya Mahaprabhu. But if one does not remember Him, even easy things become very difficult. To this Lord Caitanya Mahaprabhu, I offer my respectful obeisances”. We welcome you, your family and friends to take part in the wonderful celebration on Sunday 24th Mar 2019. 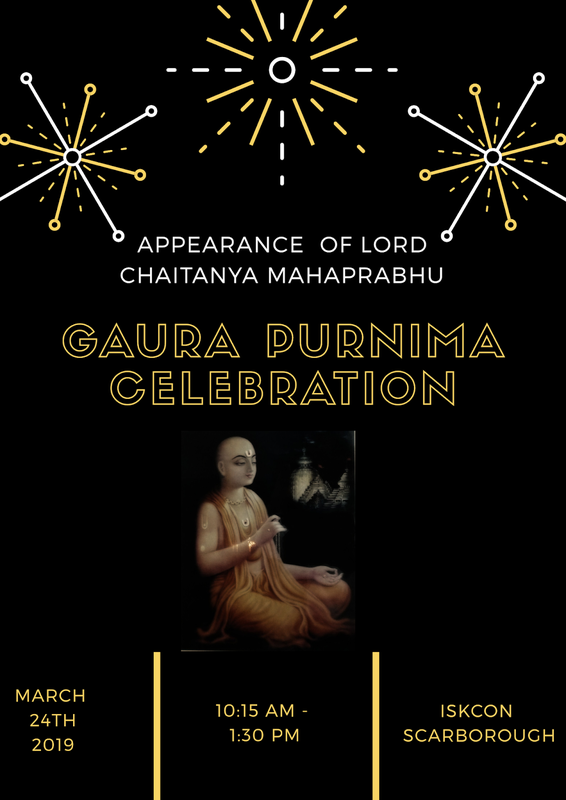 We have two very auspicious events happening on the same day coming Tuesday- Dec 18th 2018. One of the Vrata(vow) undertaken during Ekadasi is to read the Holy Scriptures. 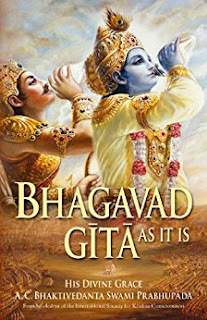 What can be more glorious on this Moksada Ekadasi than reading Bhagavad Gita on the very day that marks the 5155th appearance day anniversary? We at ISKCON Scarborough will be celebrating Gita Jayanti in a grand manner on by reading all the 700 English verses starting at 6.30 PM sharp! It was on this day 5155 years ago, that Sanjaya narrated to King Dhritarashtra the dialogue between Sri Krishna and Arjuna in the battlefield of Kurukshetra at the place now known as Jyotisha tirtha, and thus made the glorious teachings of the Lord available to the people of the world, for all time. Srimad Bhagavad-Gita shows a way to rise above the world of duality and the pairs of opposites and to acquire eternal bliss and immortality. It is a gospel of action. It teaches the rigid performance of one's duty in society, and a life of active struggle, keeping the inner being untouched by outer surroundings and renouncing the fruits of actions as offerings unto the Lord. Srimad Bhagavad-Gita is a source of power and wisdom. It strengthens us when you are weak, and inspires us when you feel dejected and feeble. It teaches us how to resist unrighteousness and follow the path of virtue and righteousness. 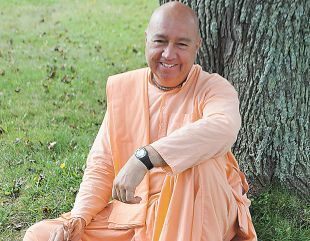 The teachings of the Gita are broad, sublime and universal. They do not belong to any sect, creed, age, place or country. They are meant for all. They are within the reach of all. The Gita has a message for the solace, peace, freedom, salvation and perfection of all human beings. There will be a grand Ekadasi feast served after the whole recitation.